The new National Museum of American Jewish History is dedicated to telling the still-unfolding story of Jews in America, who embraced freedom with its choices and challenges as they shaped and were shaped by our nation. The Museum envisions its new home as a place that welcomes all people, inviting them to discover what they have in common with the Jewish experience in America, as well as to explore the features that make this history distinctive. Rising five stories above Independence Mall, in the heart of historic Philadelphia, the National Museum of American Jewish History will join Independence Hall, the National Constitution Center, the Liberty Bell and other landmarks at the hallowed site of America’s birth. There could not be a more fitting place for a museum that will explore the promise and challenges of liberty through the lends of the American Jewish experience. Tracing the Tribe recommends the video, which demonstrates various aspects of the American Jewish community’s achievements. Pittsburgh: 125 city directories online! Searching for relatives who lived in Pittsburgh, Pennsylvania? Here’s a collection of 125 directories dated 1815-1945. The directory collection is “Historic Pittsburgh City Directories,” in the University of Pittsburgh’s Digital Research Library. Thanks to ResearchBuzz for this head’s-up. Search parameters: simple keyword (even an occupation) or advanced search; author or title. Results show which city directories contain the keyword and a count of how many hits in that specific directory. Click on “results detail,” learn more about the specific directory and see the lines that matched your search. You can also explore the community for that directory. Click on “Table of Contents,” and see that directory’s contents, including maps and advertisements. Click on those items and link to other pages. Save images of pages of interest with a mouse right-click. While ResearchBuzz noted the option to view the page as an image or PDF, it didn’t seem to work properly. While ResearchBuzz did sample searches for SMITH and “clockmaker,” Tracing the Tribe used a surname (COHEN/COHN) and keywords that might be more useful to our readers. — Wiggins’ directory of Greensburg and Westmoreland County for 1890-91 containing, in alphabetical order, the names, occupations and residences of the inhabitants of Greensburg, also of a list of the taxpayers in the township, giving the assessed value of real estate and personal property. 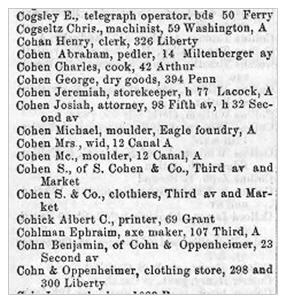 — Harris’ Pittsburgh business directory for the year 1837 : including the names of all the merchants, manufacturers, mechanics, professional, men of business of Pittsburgh and its vicinity. — 1920 The Pittsburgh social secretaire. — 1917 The Pittsburgh Jewish community book; comprising the names and addresses of members and the history of Jewish organizations, also a history of the Jewish community of Pittsburgh. — 1898 Directory of all business and professional men and official guide of Beaver County, Penn’a. : together with a complete map. — Directory of Pittsburgh and Allegheny cities, 1864-1865. — The Pittsburgh and Allegheny blue book, 1895, Vol. 9. — 1878 A confidential business report of Pittsburgh and Allegheny. Author: Business Men’s Protective Association. — c1880 Watson & Co.’s classified business directory of Pittsburgh, Allegheny, and prominent towns within a radius of forty miles. Scrolling through more recent books, numbers rise with the growth of the Jewish community in the city and surrounding areas. On the Historic Pittsburgh site, there are top tabs for Full Text, Maps, Images, Finding Aids, Census, Chronology and the HSWP Catalog. Under Images, find more than 13,000 historic photographs in 44 collections, including the recently added 27-image Hebrew Institute Collection (1915-1970). Tales of success: How sweet it is! Back in June, Kevin Bowman in Ohio wrote to Tracing the Tribe about his Dutch Jewish ancestry, and shared information on the Akevoth database of Ashkenazim in 18th-century Amsterdam. He used the Akevoth database to find information on his EZEKIEL family. 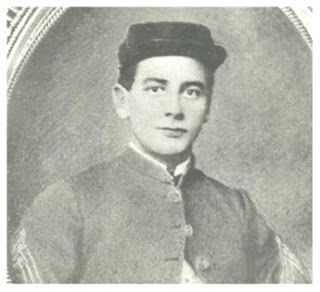 The photo below is Moses Jacob Ezekiel at the Virginia Military Institute (VMI), who fought in the battle at New Market. Just recently, he found additional success using a new UK database, SynagogueScribes.com, described by Tracing the Tribe. In addition to informing me about the Akevoth database, he described his success over several months. He reported on the ancestors of his great-great-great-grandfather Jacob Ezekiel, a prominent American Jew, whose family was mapped by Stern here. His son, Moses Jacob (photo above), became a famous sculptor. Kevin did note that the points mapped by Stern each led to a brick wall on his genealogical quest. Kevin knew the family adopted the surname in the US, but were known as Schreiber in the Netherlands. As he played with name variants, he discovered the Akevoth database. Just googling around with alternative names, one day, I ran into the Akevoth database, and found this. I was stunned to compare what I knew about the Ezekiel family to Jacob Jokeb Ezechiel Posnan(s)ki Schreiber’s family in the database. It matched nearly perfectly. Then, even more amazingly, it mapped out family trees going back another 200 years. Says Kevin, an Ohio attorney, matching American families to the Dutch database is a difficult process because of changes in spelling, surname and others. He has been successful more than once, and believes that several of Stern’s family trees could be expanded using the Akevoth database. Occasionally, he’s found people in the notes that should have been in the trees, but were somehow overlooked. As an example, he writes about Sarah Abraham Waterman (Wasserman), listed as the wife of Michiel Mozes Doesburg Gompert Kleef, but not listed among the children of Abraham Waterman, despite the clear connection. The family moved to England and became Gompertz and their children moved to the US. He recommends searching the entire website with alternative names to see if there are any missed connections, and also recommends variants with “ben” and “bat” as these constructions appear frequently. Kevin, who also has Sephardic ancestry (De Castro), says the Ashkenazi database is far better than the Sephardic stuff available. Although materials consistently report that the Ezekiels were Sephardic, as does the family legend, and the fact that they attended a Philadelphia Sephardic synagogue, records reveal a patrilineal Ashkenazi family. However, he’s never been able to connect any of the individuals listed by Rabbi Stern on the De Castro to any information regarding Sephardic Jews in the Netherlands, except for one marriage entry (possibly!). But he keeps trying! He further describes the transformation of the Kerkhoven surname into Myers in the US, which could help Myers descendants go back in time. In early December, Kevin had another round of success. Following his reading our post about CemeteryScribes.com and SynagogueScribes.com, his quest revealed the marriage record of his GGGG grandparents. I always recommend that people using new databases and sites write to them when they find success, and that’s what Kevin did. Gaby Laws of SynagogueScribes.com then forwarded his email to me. I heard about your site through the Jewish Geneablog “Tracing the Tribe.” They suggested that you may like to hear about any success in using your database. I think I may have found the marriage record of my 4xG Grandparents. Ref.No. GSM 232/39 shows a marriage record Jabob Elias (Jeker ben Eliahu) who married Eliza Barnett (Libisha bat Jacob Simon) at the Great Synagogue in London on August 3, 1825. The dates and names all seem to fit, although I did not know Eliza’s maiden name. By 1849, Jacob Elias had died and Eliza remarried, their daughter Kate married John Bowman and the whole family moved to Chicago.This new information may have knocked down a brick wall for me. We are all inspired by such stories of achievement, and Kevin has done very well in 2009. When you find success, write in or comment on the relevant Tracing the Tribe post. Also, tell the database or website described that you learned about it here. This makes all of us very happy for you! Success inspires success. Tracing the Tribe wishes Kevin and all our readers continued genealogical good fortune at this festive time of miracles! Tracing the Tribe readers in the Pittsburgh area will be interested in an open house at the Rauh Jewish Archives, on Sunday, November 8. “Finding Your Family’s Story: Jewish Genealogical Resources in the Rauh Jewish Archives” will run from 1-3pm, in the Senator John Heinz History Center library. Learn to trace your family in Western Pennsylvania and beyond by using the archive’s resources. Susan M. Melnick is the archivist at the Rauh Jewish Archives. Archivists and a professional genealogist will be present to answer questions and provide assistance in archival and online resources, as well as information on preserving family documents. The program is free with History Center admission. For more information and to register, send an email. The Jewish Genealogical Society of Greater Philadelphia will welcome Carole Le Faivre-Rochester, president of the Philadelphia Jewish Archives, at its next meeting on Monday, October 12. The topic is “The New PJAC: Where We Are and Where We Are Going.” The meeting begins at 7.30 pm at Reform Congregation Keneseth Israel, in Elkins Park. The collection of the Philadelphia Jewish Archives Center is one of the nation’s finest regional collections documenting Jewish culture and history. The PJAC’s 5 million item collection is now part of the Temple University Libraries’ Urban Archives, which documents the Delaware Valley’s social, economic and physical development during the 19th-20th centuries. At a September 9 ceremony marking the official handover, LeFaivre-Rochester received a priceless item, the 1924-29 diary of Lithuanian immigrant Israel Chanin. For more information, see the JGSGP site. See more on the PJAC here. 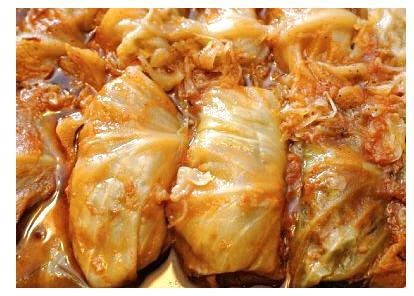 There’s nothing like my grandmother’s stuffed cabbage. We called it halupche, but other names for it are halupki, galumpki, golabki or sarme, depending on geographic origin of the grandmother who may have come from Slovakia, Serbia, Ukraine, Poland, Hungary, Belarus or elsewhere. My maternal grandmother, Chaya Feige Talalai (to become Bertha Tollin Fink), was born near Mogilev, Belarus and came to Newark, New Jersey in 1904. Her mother Riva Bank Talalai was born near Kovno/Kaunas, Lithuania and, after her marriage, lived in Vorotinschtina, Belarus, some 12 miles SSW of Mogilev. Her mother Riva was a phenomenal cook as were her sisters, one of whom became a caterer, so Grandma had a great teacher. Although she’s been gone for so long and the last time I remember her making these was even longer before her death, I can still smell that special fragrance and those huge pots she filled with mountains of rolls. And I still talk about this dish in the present tense. While I loved that sweet-sour sauce and the meat filling, cabbage was never on my favorites list. When I finished a plate, there was always a pile of limp cabbage leaves on the side. I only ate the filling. I hadn’t thought about this dish in a long time. It is food for nippy weather, for shtetl autumn and winter weather, not Mediterranean climates. It all came back to me this morning in a Pittsburgh Post-Gazette newspaper article that gave a Hungarian recipe used by Josephine Gresko, who learned it from her mother-in-law, Bertha who was a cook for a Jewish family in Brownsville. Foodwriter Miriam Rubin described the “Pig Festival,” (they call stuffed cabbage “pigs in a blanket” there, giving the festival its name, not because it utilizes pork) in Carmichaels, Greene County – a coal mining region in southwest Pennsylvania. This is a great dish for Sukkah-eating in colder climes. A local project in Pittsburgh, Pennsylvania in conjunction with the National Council of Jewish Women (NCJW) has produced 516 oral history interviews now accessible and searchable online. The story is in the Pittsburgh Tribune-Review. The project – Pittsburgh and Beyond: The Experience of the Jewish Community – can be viewed online here. The interviews were made on 11,000 audio cassettes over 32 years – more than 1,200 hours of recordings – and were available online on Tuesday, September 28. The local NCJW chapter provided the recordings to the University of Pittsburgh’s library system, which digitized them and designed a searchable site. In 1968, volunteers began interviewing the men and women who arrived from Eastern Europe 1890-1924. It expanded to include the oral histories of Pittsburgh’s Jewish residents. The interviews illustrate such community aspects as academic, business, civic, cultural, medical, political, religious, and social evolution and development in Pittsburgh, national and international events. Search parameters include given and surnames, geographical list and other subjects and keywords. Topical headings (including local proper names) are found under a generic heading for service or type. Find individuals, hospitals, newspapers, orphanages, synagogues, television and radio stations, fashion, medical and legal specializations. The geographic index includes three categories (Pittsburgh and vicinity, US and outside the US). The project’s history includes information on two books and two documentaries. There is a 2002 guide available as a PDF. Methodology and use offers more information on the updated guide which offers abstracts and indices (geographic, personal name and subject). Dates given are those provided by the respondent, and Eastern European hometown spellings were determined through “Where Once We Walked” (Avotaynu). Names of regions or provinces – when given – are in parentheses and the country of origin refers to political boundaries of the time. A timeline of achievements was created to show the project’s development. Visit the site to learn how to order copies of the interviews and of supplemental materials – if available.